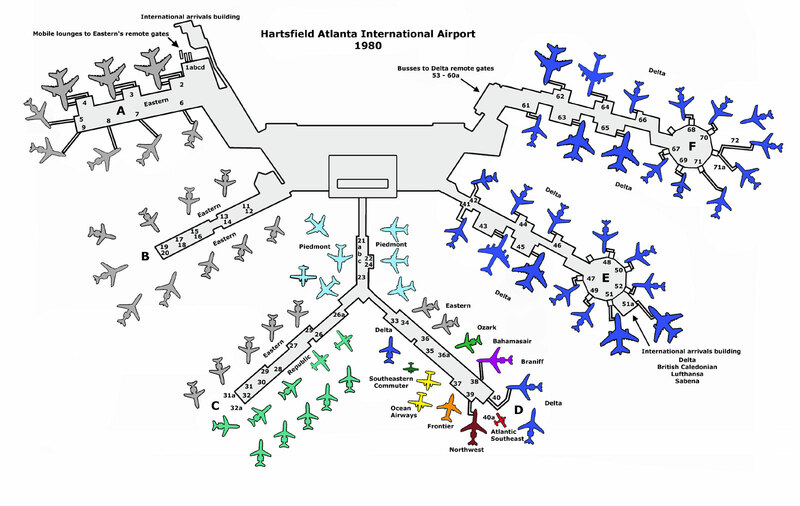 As the opening of the midfield terminal at Atlanta Hartsfield International Airport grew near, the old 1961 terminal was stretched to its limits and served more than double its increased design capacity. With no room for expansion, airlines found inventive ways to accommodate more aircraft by double parking at some gates, sharing gates or parking at angles that created space for one or two more planes per concourse. The withdrawal of United Airlines and TWA in 1979 opened up new gates for Eastern, Piedmont, Delta, and others, but space was still at an absolute premium. At the time of its closing in September 1980, the terminal served 15 airlines. 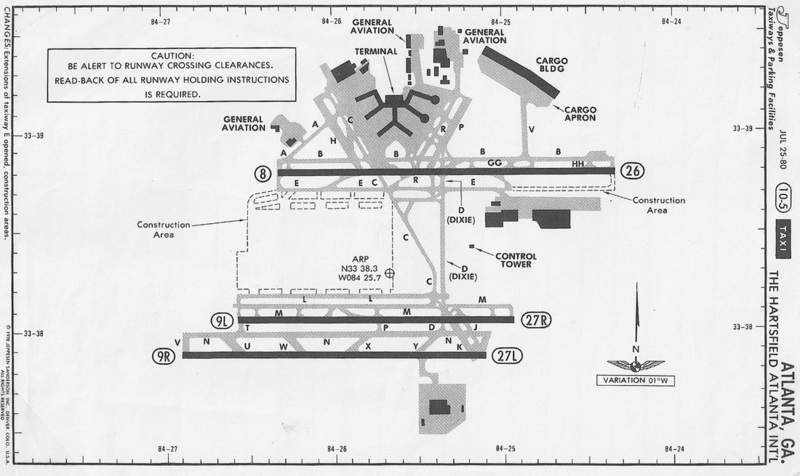 This detailed map shows the final gate configuration. A larger version is available HERE. 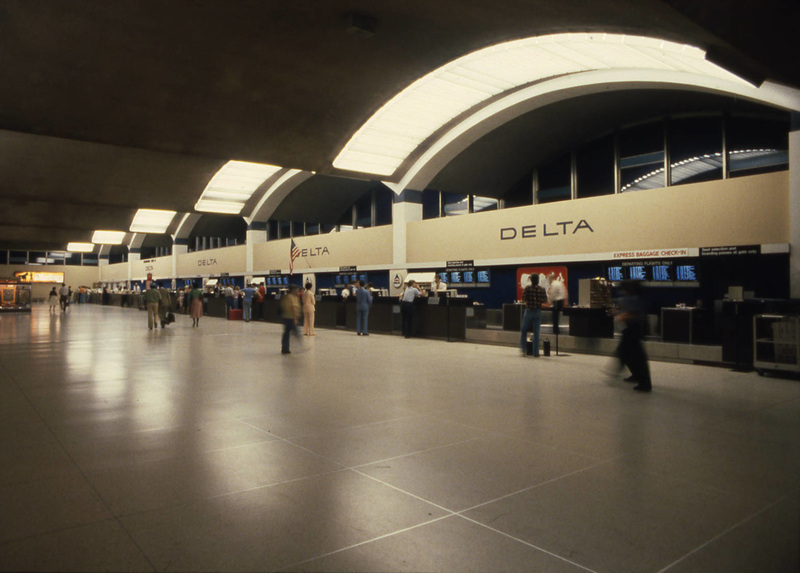 A great night view of the Delta Air Lines ticket counters at the Hartsfield Atlanta International Airport from July 24, 1980, less than two months before the terminal closed. Photo taken by Floyd Jillson and courtesy of the Atlanta Journal-Constitution Photographic Archives. Special Collections and Archives, Georgia State University Library. 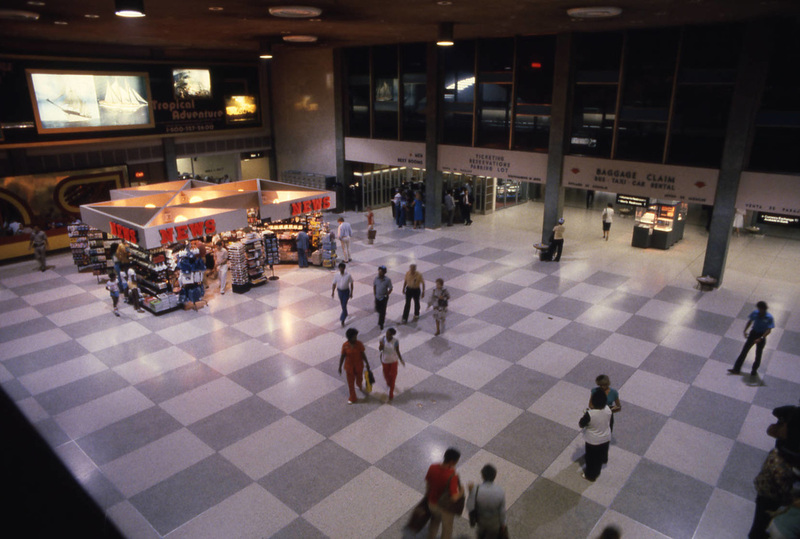 Another terrific night view of the terminal from July 1980, this one taken from the mezzanine level above the area between the ticket lobby and the concourses. The iconic blue-green Atlanta control tower was directly above this. In this view, the ticket lobby is off to the right below the baggage claim sign and the security checkpoint leading to the concourses was almost directly below the photographer. Photo taken by Floyd Jillson and courtesy of the Atlanta Journal-Constitution Photographic Archives. Special Collections and Archives, Georgia State University Library. This is a Jeppesen map of the Hartsfield Atlanta International Airport issued to Delta pilots, effective July 25, 1980, less than two months before the new terminal opened on September 21st. The old crosswind runways had been closed and removed in the mid '70s to make way for the midfield terminal. 1980 saw the arrival of additional European carriers to Atlanta. Lufthansa German Airlines inaugurated service to Frankfurt on May 1 and British Caledonian began nonstop flights from Hartsfield to London a month later. Below, a London-bound British Caledonian DC-10 heads for the taxiway in July 1980. While arriving international flights from Europe docked at the new Federal Inspection Services facility at the end of concourse E, lack of parking space meant that outbound international flights often used gates closer to the main terminal. 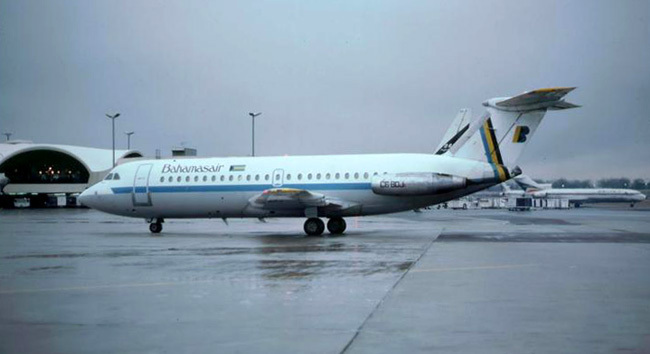 A Bahamasair BAC 1-11 flight from Nassau heads toward the gate at concourse D on a rainy day in February 1980. Piedmont took two of United's former gates on concourse D and managed to squeeze 3 planes into the space. Photo by Air Nikon. Eastern also took several of United's former gates on the east side of concourse D and also managed to make room for an extra aircraft by parking planes so close together that the wingtips almost touched. DC-9 N8916E is shown departing concourse D in 1980. Photo by Mike Sparkman via airliners.net. 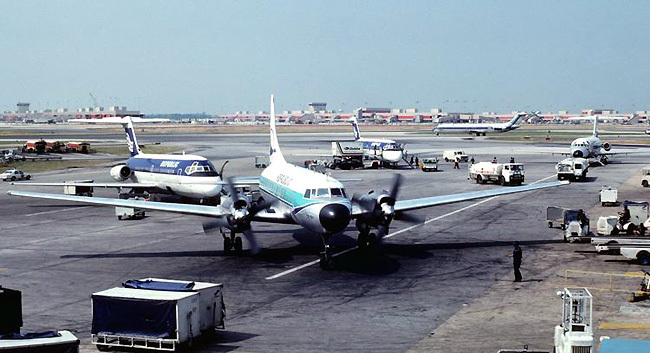 On the west side of concourse D, Delta and the commuter airlines Ocean Airways and Southeastern Commuter Airlines took TWA's two former gates. Delta used gate 33 exclusively and the commuters used gate 35 (with up to 3 aircraft at a time) but, depending on the time of day, Delta would park at both. 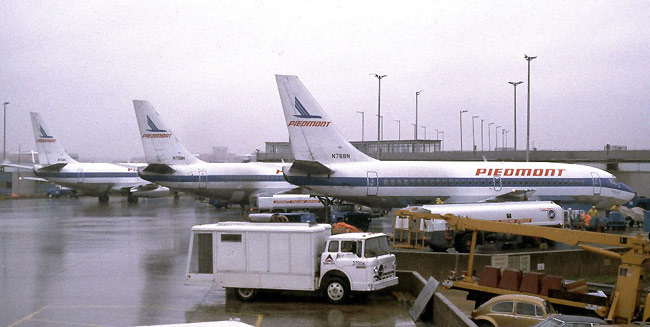 In this 1980 photo, two Ocean Airways Martin 404s are parked at #35 while a Delta 727 is parked at #33. 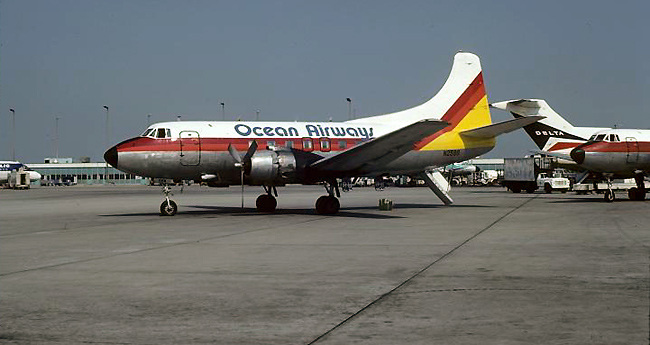 Ocean Airways took over former Air South / Florida Airlines routes to Macon and St. Simons Island on January 15, 1980 using Beechcraft B-99s, ex-Florida Martin 404s and ex-Air Sunshine Convair 440s. Republic Airlines squeezed in extra aircraft along concourse C by parking one row of planes diagonally instead of in a straight line. This is also an excellent view of the midfield terminal nearing completion in the background. Two Eastern DC-9s and a 727 parked at the end of concourse B. Particularly notable in this photograph is the old quonset-hut temporary terminal building in the background, still bearing the word Atlanta. The old World War II building had been relocated to the Hangar One general aviation area after the opening of the 1961 terminal and remained until construction began on the 4th parallel runway in the early 1980s. Photo by Air Nikon. Here's some fantastic footage from the Atlanta in May 1980, just 4 months before the midfield terminal opened. The film makes it clear how crowded the conditions were at the old terminal in its final months.